One of the keys to making an open source project work is getting feedback from users and developers about problems (bugs) in the code or system. 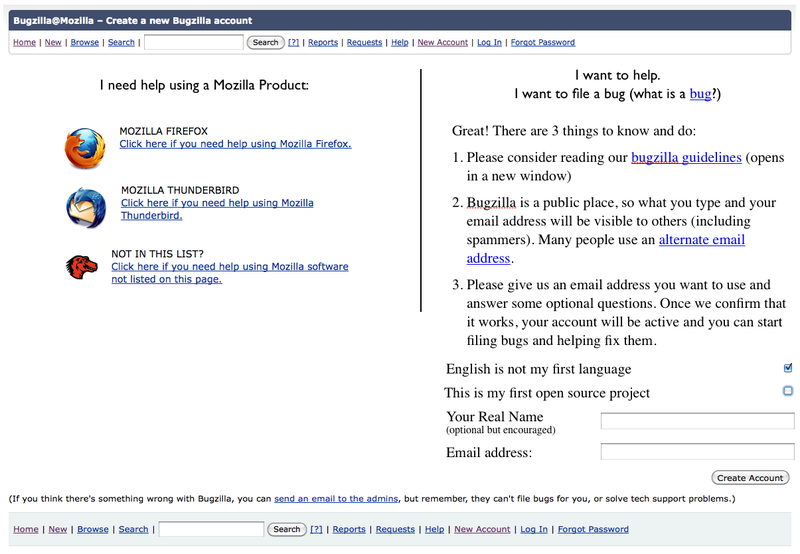 Mozilla (the organization behind Firefox and Thunderbird) uses Bugzilla, but organizations have developed a variety of systems for dealing with this issue. For example, many cities use 311. I’m going to talk about Bugzilla and Mozilla in this case, but I think the lessons can be applied more broadly for some of my policy geek friends. Engagement: For many people Bugzilla is their first contact with “the community.” We should want users to have a good experience so they feel some affinity towards us and we should want developers to have a great experience so that they want to deepen their level of participation and engagement. Efficiency: If you have the wrong or incomplete information it is hard (or impossible) to solve a problem, wasting the precious time of volunteer contributors. I also concede that these two objectives may not always be congruent. Indeed, at times there may be trade offs between them… but I think there is a lot that can be done to improve both. I’ve probably got more ideas than can fit (or should fit) into one post so I’m going to unload a few. I’ve got more that relate to the negotiation and empathetic approaches I talked about at the Mozilla Summit. One additional thought. Please feel free to dump all over these. Some changes many not be as simple as I’ve assumed. Others may break or contravene important features I’m not aware of. Happy to engage people on these, please do not see them as an end point, but rather a beginning. My main goal with this first batch of suggestions was to find things that felt easier to do and so could be implemented quickly if there was interest and would help reduce transactions costs right away. First. I thought there were some simple changes that could render the interface cleaner and friendlier. It’s pretty text heavy – which is great for advanced users, but less inviting for newer users. More importantly however, we could streamline things to make it easier for people to onboard. Once you choose to file a bug you get prompted to either log in or create an account. At this point, if you want to create an account. I thought this page was hard to read with the text spanning the whole width, plus, there is some good info we could gather about users at this point (the point it feels they are mostly likely going to add to their profile). Couple things a like about this proposed screen. 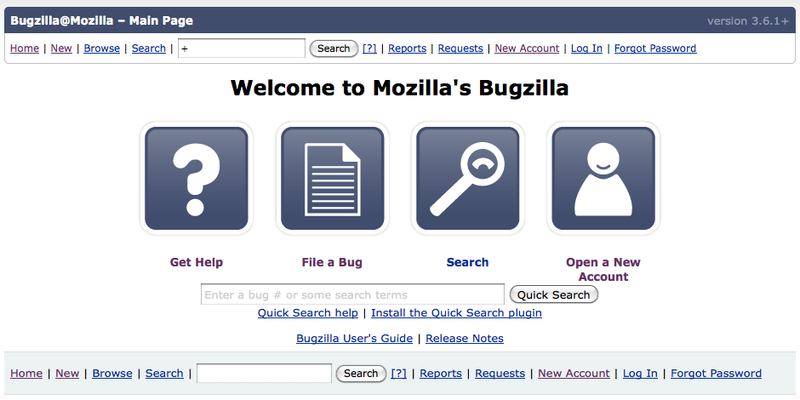 One, if you are a lost user just looking for support we likely snag you before you fill out a bugzilla account. 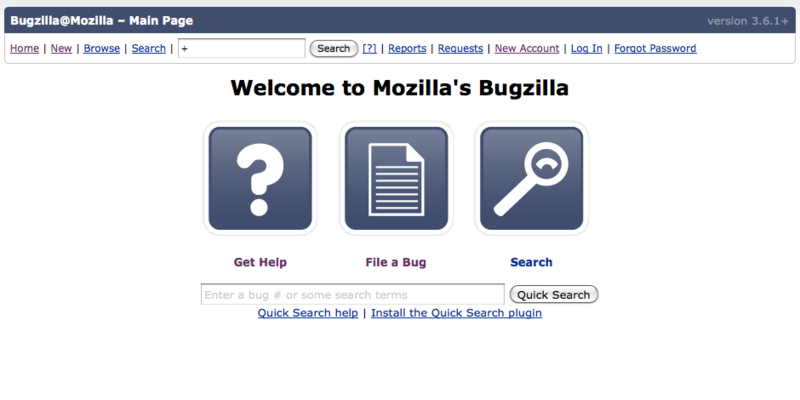 My feeling is the bugzilla is a scary place that most users shouldn’t end up in… we need to give people lots of opportunities to opt for support before diving in, in case that is what they really need. Second, in this proposed version we tell people to read the bugzilla guidelines and suggest using an alternate email before they punch their email into the email field box. In addition, we ask the user for their real name now (as opposed to relying on them to fill it out later). This nudge feels important as the more people with real names on the site, the more I think people will develop relationships with one another. Finally we ask people if English is their second language and if this is their first open source project. Finally, with the extra data fields we can help flag users as ESL or new and thus in need of more care, patience and help as they on-ramp (see screen shots below). We could even modify the Bugzilla guidelines to inform people to provide newbies and ESL’s with appropriate respect and support. I imagine that your “newbie” status would disappear either when you want (some sort of preference in your profile) or after you’ve engaged in a certain amount of activity. Here is an idea I had talking with some of the triage guys at the Mozilla Summit. Let’s suppose that someone submits a bug that isn’t really a bug but a support issue. I’m informed that this happens with a high degree of frequency. Would it be nice if, with a click of a mouse, the triage guys could move that bug out of Bugzilla and into a separate database (ideally this would be straight into SUMO, but I respect that this might not be easy – so just moving it to a separate database and de-cluttering bugzilla would be a great first start – the SUMO guys could then create a way to import it). My sense is that this simply requires creating a new resolution field – I’ve opted to call it “Support” but am happy to name it something else. This feels like a simple fix and it would quickly move a lot of bugs that are cluttering up bugzilla… out. 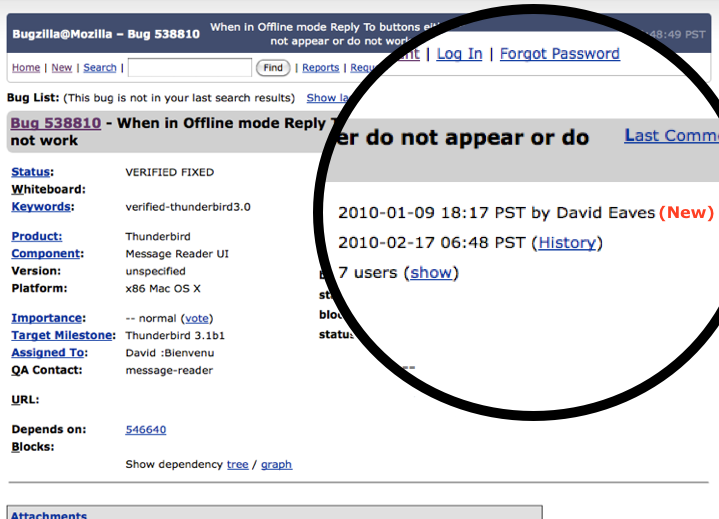 This is important as searches for bugs often return many results that are support oriented, making it harder to find the bugs you are actually searching for. Better still, it would get them somewhere where they could more likely help users (who are probably waiting for us to respond). 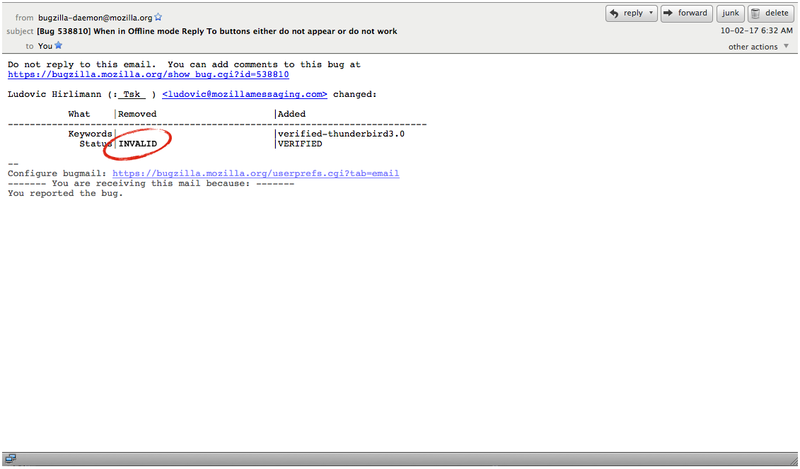 Of course, presently bugzilla will auto generate an email that looks like the first one and this isn’t going to help. So what if we did something else? Here is the auto-generated email I think we should be sending users whos bugs get sent to SUMO. I’ve proposed a few things. 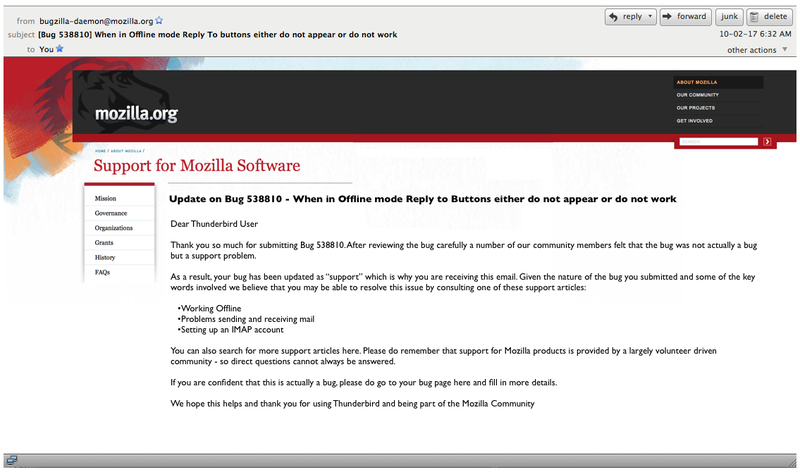 First, if these are users who’ve submitted inappropriate bugs and who really need support, giving them a bugzilla email isn’t going to help them, they aren’t even going to know how to read it. Third, when the bug gets moved to SUMO it might be possible to do a simple key word analysis of the bug and, from that, determine what are the most likely support articles they are looking for. Why don’t we send them the top 3 or 5 as hyperlinks in the email? Fourth, if this really is a bug from a more sophisticated user, we give them a hyperlink back to bugzilla so they can make a note or comment. What I like about this is it is customized engagement at a low cost. More importantly, it helps unclutter things while also making us more responsive and creating a better experience for users. BORING! 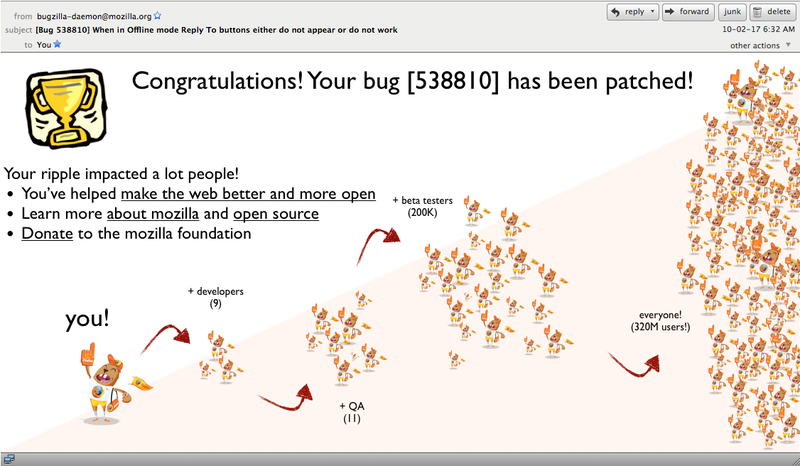 Here, at the moment of maximum joy, especially for casual or new bugzilla participants we do nothing to engage or celebrate. 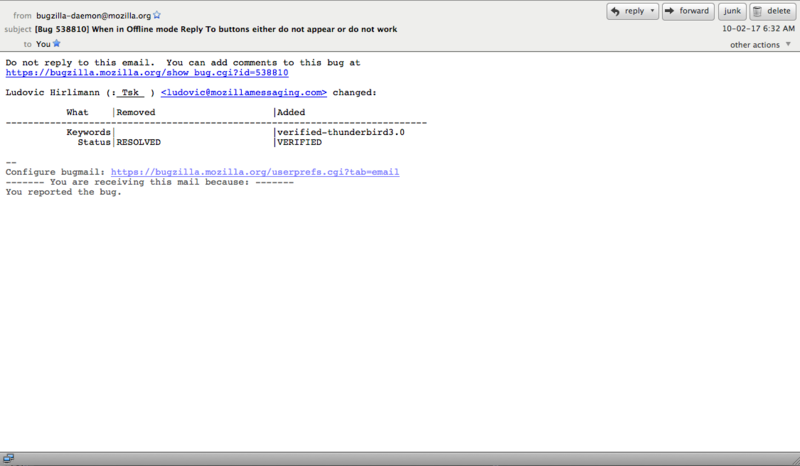 This, is what I think the auto-generated bugzilla email should look like. Again, I’m not overly attached to this design per se, it would just be nice to have something fun, celebratory and mozillaesque. Okay, it is super late and I’m on an early flight tomorrow. Would love feedback on all or any of this for those who’ve made it this far. I’ll be sharing more thoughts, especially on empathetic nudges and community management in bugzilla ASAP. This entry was posted in open source, technology and tagged bugzilla, community, community management, mozilla, negotiation, Nudge, open source on July 20, 2010 by David Eaves. Two years ago I wrote this piece outlining how Citizen Assemblies violate the conditions Surowiecki outline as necessary to create a wise crowd. My point was to show how there is a fine line between when a dialogue becomes a group monologue, or worse, just a mob. Those who engage in policy discussions need to be aware of where this line lies lest they accidentally confuse consensus and agreement with silent coercion. I experienced this problem a few months ago while attending an Imagine BC Leaders’ Summit, A Dialogue on Habitat, Health and Livelihoods :10 Big Ideas to Shape a Resilient Future. The day long event included 180+ leaders and interested parties from different sectors and was supposed to cap off discussions that had been going on about the future of British Columbia. But rather than be an open dialogue, the discussion was intensely closed and, to be frank, bordered on fascist. Things started off innocently enough. The conversation opened up with a number of participants strongly advocating that British Columbia, and the world, needed a zero growth economy. The term was never explained or explored, but it was made clear that continued economic growth was impossible and threatened the plant. I felt concerned that a group of people who could afford to take an entire workday off to talk about the future would suggest that a zero growth economy was necessary (as quickly as possible) especially in a world where over a billion people live under $1 a day. I suspect that the underlying interest in zero-growth had to do with environmental sustainability but nobody used an alternative term such as a sustainable economy, ecologically sensitive economy or carbon neutral economy. No, it had to be zero-growth. Such an outcome is great if you’ve already got wealth, but it necessarily marginalizes those that don’t. The topic however, was less important than the process. A few people (including me) voiced our concern over the zero growth term in a smaller breakout session but never in the plenary discussion. I asked some of the other concerned voices why they didn’t speak up: most had concluded within the first 30 minutes of the day that speaking out on environmental issue simply wasn’t safe. I had to agree – I wasn’t speaking up either. Of course, once a group appears to have consensus – because alternative perspectives have censored themselves – it doesn’t take long for the conversation to move into some disturbing places. Back in the plenary discussion the group had concluded that imminent environmental catastrophe was the pressing issue of our time and all other issues were subordinate or secondary. The conversation then quickly shifted to assessing why people outside the room (the general public that is) didn’t feel the same sense of urgency. In a conversation that would have made the authors of The Death of Environmentalism shudder with familiarity, at no point was there any introspection about how the people in the room had failed t engage others effectively. Instead, exogenous factors were immediately cited. Specifically, two emerged as key problems. First, the educational system wasn’t advocating “the groups” point of view sufficiently and second, the political structures discriminated against their issue specifically. The conclusion, the school system needed to be taken over so as to appropriately educate people and the electoral system needed to be reformed so as to produce outcomes the group favoured. If that doesn’t sound like a scary or fascist conversation, imagine the same conversation structure, but with this subject. In a dialogue setting a group of evangelical Christians determine that most pressing issue is the fast approach day of rapture and, due to lack of awareness and concern, many souls would not be saved. They conclude that the reason people don’t care about the rapture isn’t because evangelicals haven’t been effective at reaching out and engaging people but because a) they don’t control the educational system, and b) the political system is structured to not favour their issue. They conclude that must take over the schools and so kids can be taught Christian values and that the electoral system needs rejigging to produce outcomes that favours “Christian” issues. Same conclusions, different subject matter. This is why dialogues have to so carefully facilitated. It isn’t hard for them to become a mob and for the discussion to get angry and totalitarian. Oh, and a final note. During the afternoon, in a moment you couldn’t have scripted, the fascist subtext of the conversation became explicit. During the Q&A after Thomas Homer-Dixon’s presentation, one participant asked “Your data on ecological collapse is terrifying. But enough isn’t being done. Do we have to take a page out of history and get the jackboots and the brownshirts out and just mobilize aggressively?” (I really almost lost it when this question was asked). Homer-Dixon, to his credit, was clearly taken aback and ran the other direction outlining that such an approach was not an appropriate solution. Jackboots? Brownshirts? We weren’t a dialogue anymore, we were a mob. At least now it was explicit. This entry was posted in commentary, negotiation, public policy and tagged british columbia, citizen assemblies, commentary, dialogue, environmentalism, imagine BC, negotiation, public policy on September 14, 2009 by David Eaves. Embedded below is the talk I’ve given to both community hackers (at Open Web Vancouver) as well as City of Vancouver Staff regarding the opportunities and challenges around open data and the open motion. (Here’s an update on where Vancouver is at courtesy of some amazing work by city staff). For those willing to brave through the presentation (or simply fast forward to the end) one piece I felt is most important is the talk’s last section which outlines what I term “The Bargain” in a reference to the informal contract Clay Shirky says exists between every Web 2.0 site and their users. The bargain comes last, because it matters only if there is a promise (open and shared data) and a set of tools (applications languages) that are already working together. The bargain is also the most complex aspect of a functioning group, in part because it is the least explicit aspect and in part because it is the one the users have the biggest hand in creating, which means it can’t be completely determined in advance… A bargain helps clarify what you can expect of others and what they can expect of you. I believe that in an open city, a similar bargain exists between a government and its citizens. To make open data a success and to engage the community a city must listen, engage, ask for help, and of course, fulfil its promise to open data as quickly as possible. But this bargain runs both ways. The city must to its part, but so, on the flip side, must the local tech community. They must participate, be patient (cities move slower than tech companies), offer help and, most importantly, make the data come alive for each other, policy makers and citizens through applications and shared analysis. View more documents from David Eaves. This entry was posted in free culture, negotiation, open source, public policy, public service sector renewal, technology, vancouver and tagged free culture, negotiation, open data, OpenCities, public service sector renewal, technology, vancouver on July 27, 2009 by David Eaves.